The Willow Winter Carnival is like no other carnival I have ever been to. They have a Frostbite 5k, snow-shoe softball, dogs weight pulling, good food, bingo, bands and lots of handcrafts. They also have the Earl Norris Memorial Sled Dog Race. It is named after one of the most iconic names in sled dog racing in Alaska, if not North America. Earl and Natalie Norris’ name can be traced far back into the Siberian Husky history in the United States and their kennel is still in operation right here in Willow with their son, John (JP) Norris running sprint races like the Fur Rondy and their granddaughter, Lisbet Norris running in the Iditarod. The Earl Norris race has been ran as part of the Winter Carnival since the early 1960’s. It was an honor to have the privilege to compete in this race this past weekend. I have said it once and I will say it again, we are not sprint mushers but I thought it would be fun to get out on the trails and enjoy the new snow and the beautiful weather as we head into the middle of the winter here in Alaska. Friday night we had sign ups during the carnival kick-off dinner at the Willow Community Center. I was the third musher to sign up for what eventually would be 14 entries. The fee was a hundred bucks with the top ten finishers in the money, so to speak. The morning was a chilly minus eight degrees at the start of the race. I drew bib 7 so I would be heading out at 10:14. The time started as soon as we launched from the truck. I rode the brake as we headed onto the lake. 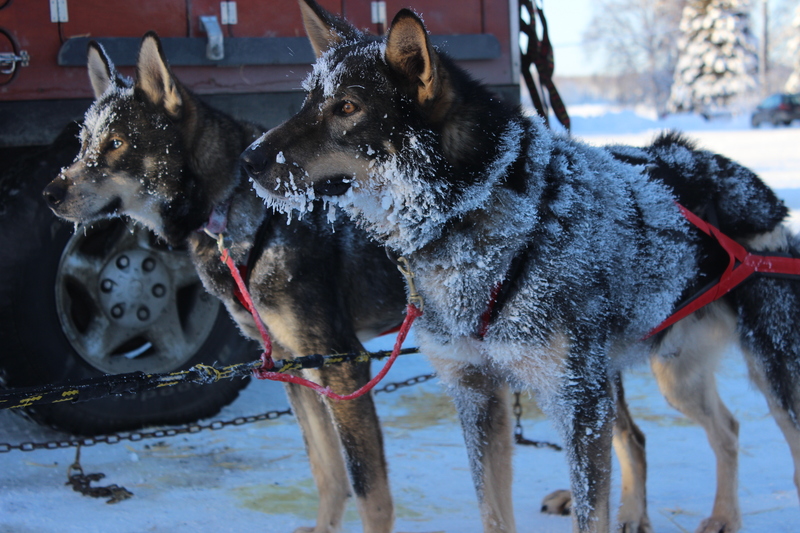 I had Frosty-TyTy in lead, Shock-Burton, Barrel-Gabby, Aussie-Lock, and the big boys Trapper and Valdez in wheel. Along the 31 mile race route we would have four road crossings, a plywood bridge over some glaciated ice, a loop on the swamp and several turns that you had to be on your toes for. The trail was marked simply with red plates on the side of the turns and the occasional blue plate to indicate you were on the right trail. Throughout the run we passed and were passed. I passed several teams and wouldn’t see them again until after the end of the race. The trail was beautifully groomed and the sun was bright. 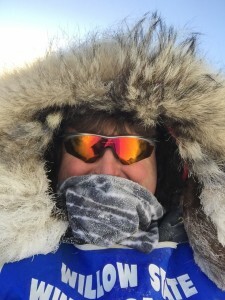 It was cold enough to pull up the hood on my parka and pull out my sunglasses on the bright snow. The race was broken up into roughly thirds. The first third was marked by two road crossings and a long down hill along a road as we neared the Willow Creek Campground and onward to the Willow Swamp. The Swamp loop was roughly eight miles and the last third was in reverse with the road being slightly uphill for a couple miles. It was just enough of a grade were I kicked with the dogs but not enough that required a whole lot of effort from man or beast. We made it to the finish in just seconds over three hours. That means we were going a little faster than 10 miles per hour. This is above average speed for us but we wanted to keep it under 11 mph anyway. I finished the day in ninth place. All teams but one would advance to day 2. There was a four hour cut-off. We snacked the dogs with salmon snacks and were home by 3:00. It was a great day of mushing for Team Ineka! Sunday’s race started off much the same as the day before except I was going out fifth instead of seventh. In most sprint races you go out in reverse order than the day before with the slower teams heading out first. Bib 2 didn’t show up so we had to wait ten minutes before we could get started. Before the race Nicole and I discussed if we should put Shock in lead and move TyTy back in swing (behind the leaders). I decided to keep the more veteran TyTy up front for the start. We shot off down the hill and onto the lake in fine fashion, finishing our first mile in just over four minutes. That is blazing fast for our team. As I said previously, our goal was not to go super fast, just a nice steady 11 miles per hour. We made it over the first road crossing before we passed the first team, bib 1 and then hit the long wide road before we saw Peter Duncan’s Siberian team. We passed Peter (bib 4) and as soon as we did TyTy put on the brakes and did not want to run ahead of the team that we just passed. I quickly changed out Shock and TyTy with the young patawan up front with Frosty. While I was changing out the leaders Peter passed us again. As we got close to the Willow Creek Campground at the bottom of the long down-hill road I passed Peter again before we headed into the woods. Over the next few miles Nick Petit (Bib 8) passed me and a few other fast teams as well. We had a great run until we got into the Willow Swamp, at about 12 miles into the run. I could see smoke billowing in the distance and knew it was a team camped on the side of the trail. We were told that we would see teams on the Swamp from the Knik 200 race that was going on at the same time. As we approached the camping team head on, Shock and Frosty thought they might head over to join them for a snack. This caused a major tangle with my team and several of the sprint teams passed me as I was getting the dogs lined out. We lost about 4 minutes due to the tangle and my average speed quickly went down from 11.9 mph to 10.3 according to my Sunnto watch. No worries. We still had 2/3 of the race to go. James Wheeler passed me and then I passed bib 4, 3 and 1. I would stay out ahead of those three teams from the rest of the race ensuring a ninth place finish unless my dogs really slowed down. As we were coming off the swamp bib 7 and Lisbet (bib 6) passed me and we passed a couple Knik 200 teams head on. The rest of the race was beautiful and sunny and a bit warmer than the day before. My team finished strong with Peter’s team close behind me. After all the teams were in we had a quick awards ceremony. I did finish in ninth place and “in the money”. Maybe there is something to this sprint mushing thing after all. I have finished in the money in all the sprint races I have done up here in Alaska. It may not be much but its way more than we have one in distance races! It was a great weekend of mushing I am glad we got to take the team out for a couple really nice runs. We made it home by 3:30 just in time to watch the Super Bowl!